To have a more successful blog, I really need to post more often than once a month! My last post was September 26, and a lot has happened since then. Ran 19 miles, then got in a car and drove for 6 hours to get to a conference. I drank a lot of coffee, so had to make many pit stops, which turned out to help with the stretching. I was not nearly as stiff as I thought I’d be. With temps between 65-75 degrees on the run, pants were perhaps too warm. Thus, the salty knee. But at least I knew these pants would work for cool weather on marathon day. Got up early to do a couple of dreadmill runs in an overheated hotel workout room while at a conference. Drove home and caught the edge of a devastating early-season blizzard. The biggie: the 20-mile run, segmented as 7 miles/break/7 miles/break/6 miles. Impressed myself with an 11:59 average pace. I felt so much better after eating and drinking sugary stuff at the 14-mile break that I confirmed my need to fuel well during the marathon. All further training runs will be shorter than this!!! About 36 hours after the blizzard began, there were blue skies in Gering. 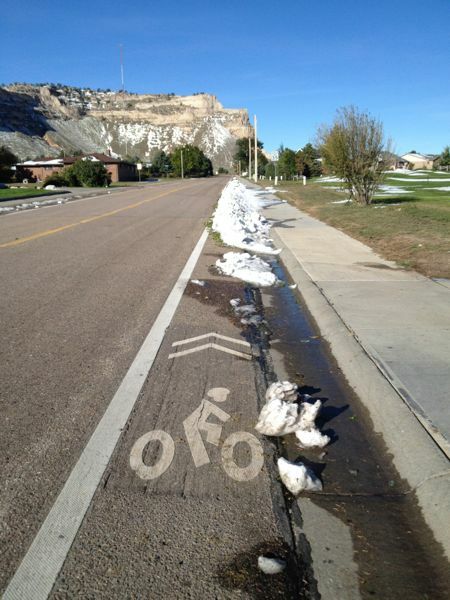 And a slowly melting pile of snow that some nimrod piled up into the bike path. Because no one uses the bike path in the winter, right? 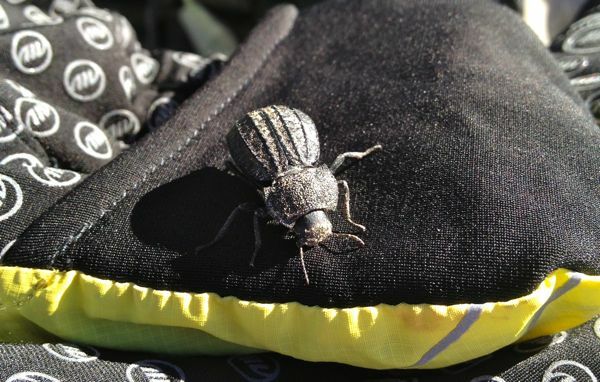 There were still insects out and about on the pathway, despite the snow on the ground. When Bugman and I run, we often stop to gawk at the little critters. 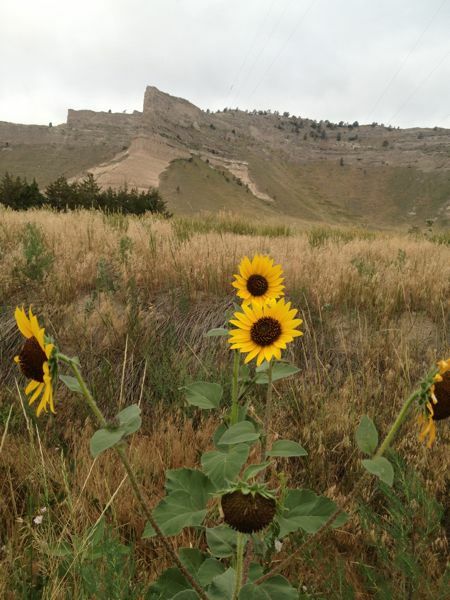 Good thing our planned route did not include Scotts Bluff National Monument. 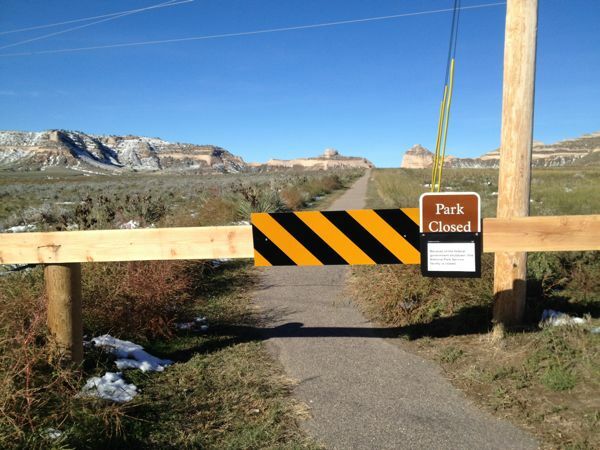 #governmentshutdown #geethankscongress So glad the parks are open again!!! Whoops! Blocked running path! 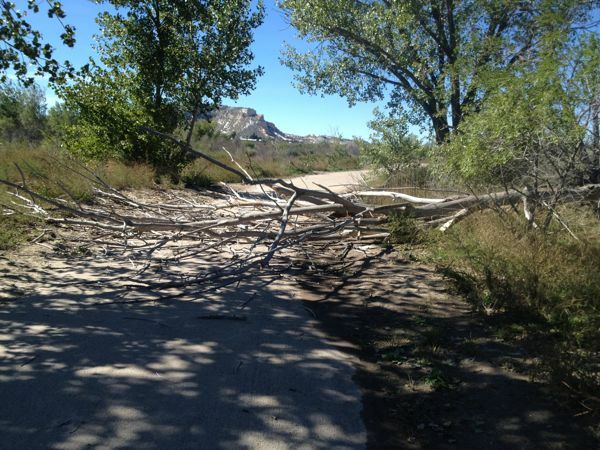 Thanks to the weight of the wet snow, the still-leafy trees, and high blizzard winds, there was a lot of tree damage in the area. I stretched my hamstrings post-run by picking up, chopping, and stacking the fallen branches in our yard. Woo hoo! Cool enough now (high of 65) to be able to get my training runs done after work. No need to get up at 4 am! “Only” had to run 12 miles! 4-mile birthday run – one mile in celebration of each decade. Grateful for a friend agreeing to meet for an early morning moonlit run, before another snow shower hit. Got up early to volunteer for the 5K/10K Fall Frolic race, then ran 8 in the afternoon, with a speedy 11:11 average pace. Departed for Dublin, Ireland, for the marathon. Our morning flight from Scottsbluff to Denver was cancelled due to fog. We scrambled to get a later flight out of Denver and drove there instead of flying. Managed to catch our international flight out of Washington-Dulles. Could not sleep on the overnight over-ocean flight. For some reason years ago, I got the wild idea that I would run the Dublin Marathon for my 40th birthday. I do actually follow through with some of my wild ideas . . . Arrived in Dublin. In an attempt to reset the body clock quicker, walked around the city in (overcast) daylight until it was time for bed. 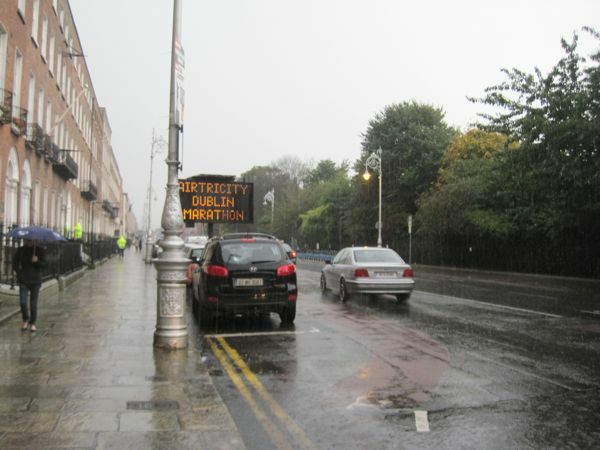 Early warning of road closures due to the marathon at Merrion Square Park. Glad I packed an umbrella! Did a lot of walking and sightseeing. Popped into the expo to pick up our race packets. It was a little intimidating to see the THOUSANDS of race numbers. More than 14,600 people registered for the race! 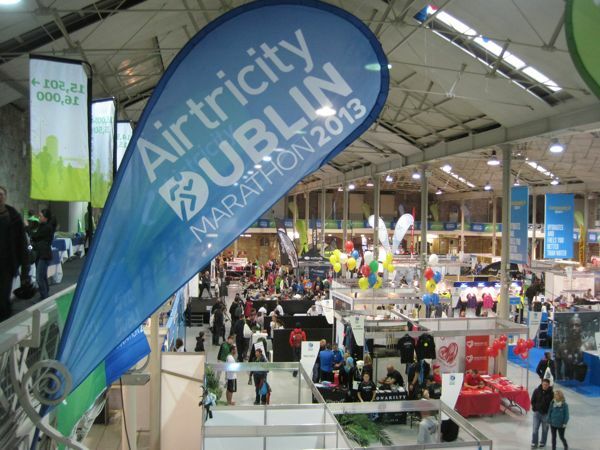 2013 Dublin Marathon expo at the Royal Dublin Society. International Breakfast Run. (A post on this later.) Because of the forecast, headed back to the expo to buy a rain jacket. I have not run a step since, but I am headed out this afternoon to buy a new pair of running shoes (left my worn-out pair in Ireland to make room in the luggage for souvenirs). I am looking into a half-marathon Thanksgiving weekend. Might as well make use of the fact that I currently consider 13 miles to be a “short” run! A few more posts coming soon! A panoramic – too bad I didn’t catch it about 20 minutes later – the sky was on fire then. 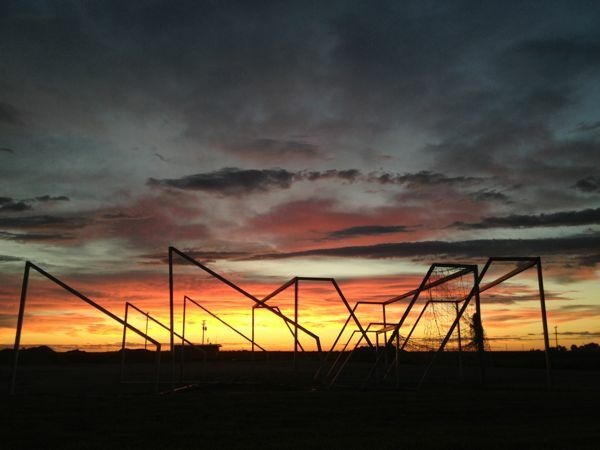 My favorite – sunrise with soccer goals. The sunrise on this day was fantastic. I felt like I was moving through color. Running continues to be difficult for me, so I am always seeking ways to motivate myself. One way of motivating myself is thinking about how badass I am when I do things like run 5 or 8 miles before heading off to work. Especially when I can remember waaay back to the accomplishment of running my first 5K. I eat 5Ks and 10Ks for breakfast! I felt like a bit of a quitter, not striving for my goal miles that day. But then a friend helped me realized that I RAN A HALF-MARATHON AND THEN WENT TO WORK!!! I can recall running a half marathon and being totally shot the rest of the day. But there is still tension about whether I can really pull off this full marathon thing. But I know all too well how illness or injury can crash the party and mess up a race attempt. All I can do is keep trying. This blog post has no photos. (You’re welcome.) The post title is both literal and derogatory. During my 18-mile run this weekend, I noticed a strange bright color soaked into the tip of my shoe. Did I kick some juicy red berries? When I got done running and took my shoe off, i discovered that my sock was soaked with blood. I never did feel pain from it, but apparently a toenail was prised up from the repetitive impact of running. The pain I DID feel hit when I got into the shower. 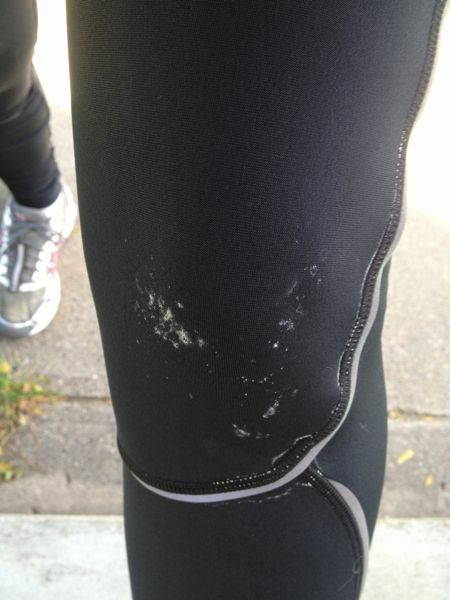 Sweat salt running off into chafe wounds – aaaughhhh! Ever since I exceeded about 3 hours out on the course (recall, I am a slower runner), my clothing has started eating through my skin. Last run, I tried using some anti-chafe chamois butter to prevent the problem, but no dice. Hoping I can find a way around this newest trouble! Ah, marathon training . . . Still feeling the effects of my long run this weekend. On my 5-mile run this morning, my thigh muscles started screaming again after about a mile. I distracted myself by taking a picture. 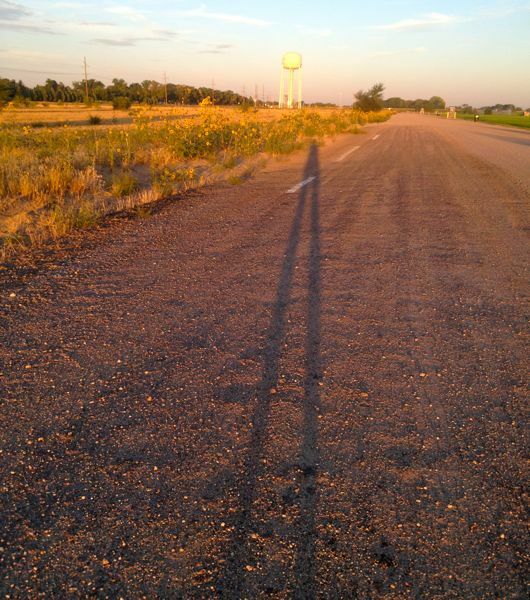 Long shadow and wild sunflowers at sunrise. The good news is, my tetchy ankle, which acted up on my 17-mile run, was just fine this morning. Here’s hoping my 8-miler (tomorrow or Friday) does not require the use of painkiller . . . This morning, I got up at 3:45 am so I’d be awake enough to head out the door by 5 am to get 17 miles done before it got too hot. I was a little worried I wouldn’t be able to complete the run. Because of my bike tour last week (still working on the epic blog post for that epic ride), I had not run for 12 days. When I ran 8 miles four days ago, my muscles were pretty sore. I was still sore this morning. But my friends on social media encouraged me. May be in trouble. My 8 miles yesterday left me sore, but I’m supposed to do SEVENTEEN this weekend. Pathetic how quickly I lost my conditioning during those 12 days off running while I traveled and biked. Friend 1: All about momentum. The first step is always the hardest. Friend 2: Hang in there, I’m told it comes back faster. Friend 3: I’d just try and relax and run the 17 as well as you can. I bet even if you are sore this week it will pass soon. You just needed this week to break everything back in. Friend 4: Just take it nice and easy and you’ll be fine. … You’ve got this Katie! And I got a surprise package from a friend in Colorado: a fuel belt, so I could “hydrate, hydrate, hydrate.” That was definitely a motivator. This morning was the first time I’d needed a headlamp when running. There are some cool things about starting a run at o’dark-thirty. Yes, the temperature, of course. 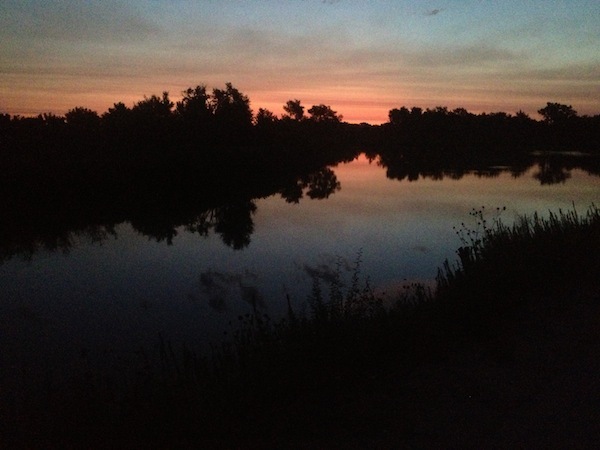 That’s one thing marathon training over the summer does for you – gives you lots of opportunities to appreciate the beauty of early morning. Thank you, Denée, Cec, Laura, Michelle, Maggie, Jeff, TR, and all you other folks who have helped me and encouraged me on this crazy marathon journey. I was beginning to wonder there. On Wednesday, I had a horrible-feeling run cut short at 4 miles at 11:30 pace, my heart hammering between 170-180 beats per minute. Tried a redo the following day, wound up short of 6 miles at 12:36 pace, heart hammering again. My friends worked to make me feel better. But if I felt this crappy when I was running just 6 miles, I know myself too well to know that I would not continue to suffer like that and would abandon my training. My marathon goal was in jeopardy. I was dreading my long weekend run. How would I hold up to 11 miles? I made sure to drink a lot of water the day before my long run, since I was outside a lot. I also probably ate more than was wise. “Fueling up,” I told myself. I packed a stupid fanny pack with some small water bottles for the run. (Geez, I hate being burdened with the sloshy weight!) I was going to be sure to stay hydrated! 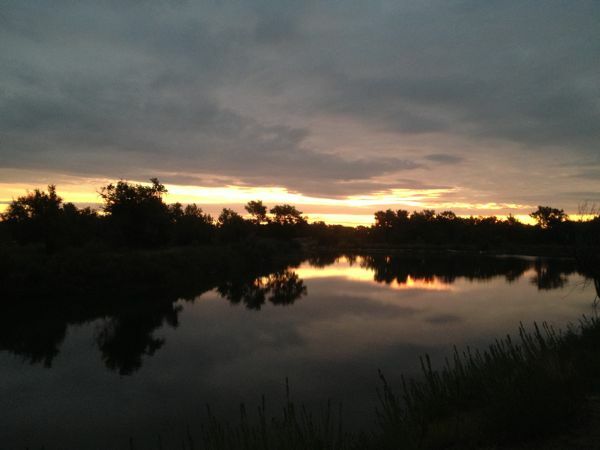 On the morning of the run, I caught myself starting out at a sub-11-minute pace. It’s so hard to pace myself when so many metrics in running revolve around getting faster. Just because I CAN run that fast for a time, doesn’t mean I SHOULD when I have a long run ahead of me. I slowed it down, and kept a pretty darned steady 12:15 pace. Got to about mile 3 and realized I wasn’t suffering . . . 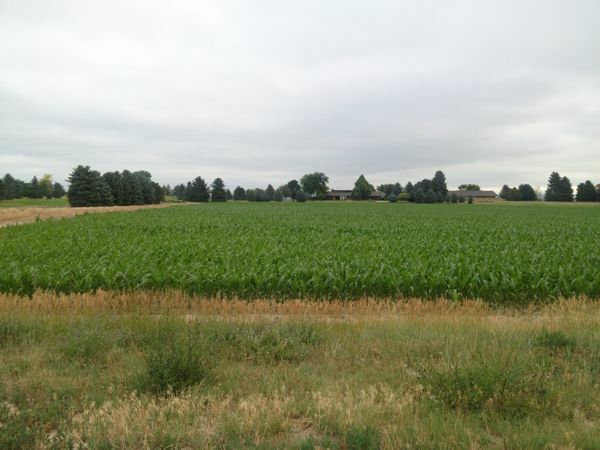 I imagined that the sound of corn leaves slapping in the wind was applause. I got to the pathway next to the Monument and was cautiously optimistic. How could I be other than optimistic in such beautiful surroundings as these? Yes, this really is Nebraska. I downed half a bottle of water and carried on. I encountered several other runners and bikers on the path to the Monument visitors center, including a guy wearing neon orange who’d passed me on the way up the County Club hill. “Good job,” he said, apparently recognizing me from a few miles back. Gosh, I love how runners are so supportive of each other. 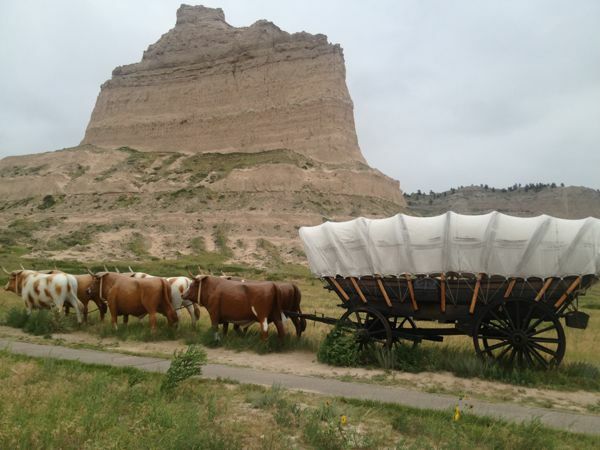 I was feeling so good, I went right past the visitors center, ran “on the Oregon Trail” and took advantage of a fiberglass oxen photo op. See? Life is great! I’m not pulling a loaded wagon! Or wearing a pioneer dress! Downed a Gu and another half bottle of water, plus a slug at the drinking fountain, and off I went on the downhill portion. I was kind of dreading mile 9-10, where I hit the wall the last time I ran this route. I drank the rest of my water at my previous “hit the wall” point. Only about two miles left. I can do this! Yes, my legs got a little tired by the end of the run, but my endurance was there! I even made it 11.82 miles!! I mowed the lawn, then took a nap, and hardly felt sore. I think I can do this marathon thing!